Broccoli is a green vegetable (Brassica oleracea var. italica) in the flowering plant family Brassicaceae (formerly Cruciferae), characterized by fleshy green flower heads arranged in a tree-like fashion on branches sprouting from a thick, edible stalk. 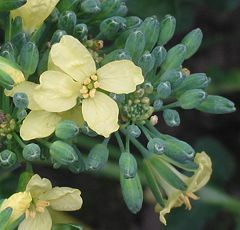 The term broccoli also is used for the edible flower clusters and stalk of this plant. 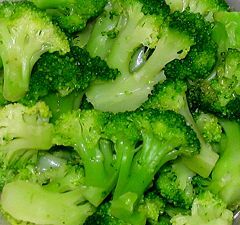 Broccoli closely resembles the vegetable cauliflower, which is the same species as broccoli, Brassica oleracea, but a different cultivar, though broccoli is green rather than white like cauliflower. Broccoli is one of a vast array of plants that provide value to human beings. In the case of broccoli, it is a broadly nutritious food. Broccoli is a good source of vitamin C, iron, fiber, potassium, vitamin A, calcium, zinc, magnesium, carotene, and vitamin B. It is thought to be important in the prevention of certain types of cancer, along with diabetes, heart disease, osteoporosis, and high blood pressure (Allen and Allen 2007). The plant family Brassicaceae (also called Cruciferae), to which broccoli belongs, is known as the "mustard family" or "cabbage family." The family contains species of great economic importance, providing much of the world's winter vegetables. These include cabbage, broccoli, cauliflower, brussels sprouts, collards, and kale (all cultivars of one species, Brassica oleracea), Chinese kale, rutabaga (also known as Swedish turnips or swedes), seakale, turnip, radish and kohl rabi. Other well known members of the Brassicaceae include rapeseed (canola and others), mustard, horseradish, wasabi and watercress. The family was formerly named Cruciferae ("cross-bearing"), because the four petals of their flowers are reminiscent of crosses. Many botanists still refer to members of the family as "crucifers." According to ICBN Art. 18.5 (St Louis Code) Cruciferae is to be regarded as validly published, and is thus an accepted alternate name. The name Brassicaceae is derived from the included genus Brassica. Broccoli is classified as the Italica cultivar of the species Brassica oleracea. (A cultivar is a cultivated plant defined by a specific, heritable set of characteristics.) It has a dense cluster of flower buds, which typically are a deep emerald green but may be tinged with purple (Herbst 2001). The large mass of flower heads is surrounded by leaves; the flower buds sit on an upright, also edible stalk. The word broccoli comes from the Latin brachium, meaning arm, via the Italian braccio. Herbst (2001) states that the name broccoli comes from the Italian for "cabbage sprout." Common varieties of broccoli include calabrese and purple sprouting broccoli. Broccoli is a cool-weather crop that does poorly in hot summer weather. The flower clusters and stalk are usually boiled or steamed, but they may be eaten raw and broccoli has become popular as a raw vegetable in hors-d'oeuvre trays, called crudités. The flower clusters are eaten before the flower buds open. Broccoli is a very nutritionous vegetable. It is high in vitamin C, vitamin A, riboflavin, calcium, iron, and soluble fiber. It also contains multiple nutrients considered to have potent anti-cancer properties, including diindolylmethane and selenium. The 3,3'-Diindolylmethane found in broccoli is a potent modulator of the innate immune response system with anti-viral, anti-bacterial, and anti-cancer activity (UCB 2007). Broccoli also contains the compound glucoraphanin, which can be processed into an anticancer compound sulforaphane. The nutritional benefits of broccoli, however, are reduced if the vegetable is boiled (UWMC 2007). Broccoli is a cultivar of wild cabbage. Wild cabbage originated along the northern and western coasts of the Mediterranean, where it was apparently domesticated thousands of years ago. That domesticated cabbage was eventually bred into wildly different cultivars, including broccoli, cauliflower, cabbage, kale, kohlrabi, and brussels sprouts, all of which remain within the same species. Roman references to a cabbage-family vegetable that may have been broccoli are not entirely clear. The Roman natural history writer Pliny the Elder wrote about a vegetable that fits the description of broccoli and some vegetable scholars recognize broccoli in the cookbook of Apicius. Test plot-grown broccoli near Salinas, California, USA. Broccoli was an Italian vegetable, as its name suggests, long before it was eaten elsewhere. It is first mentioned in France in 1560, but in 1724 broccoli was still so unfamiliar in England that Philip Miller's Gardener's Dictionary (1724 edition) referred to it as a stranger in England and explained it as "sprout colli-flower" or "Italian asparagus." In the American colonies, Thomas Jefferson was also an experimental gardener with a wide circle of European correspondents, from whom he got packets of seeds in exchange for rare vegetables from the Americas such as tomatoes. He noted the planting of broccoli at Monticello along with radishes, lettuce, and cauliflower on May 27, 1767. Nevertheless, broccoli remained an exotic plant in American gardens. In 1775, John Randolph, in A Treatise on Gardening by a Citizen of Virginia, felt he had to explain about broccoli: "The stems will eat like Asparagus, and the heads like Cauliflower." 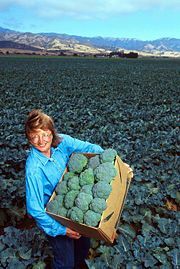 Commercial cultivation of broccoli in the United States can be traced to the D'Arrigo brothers, Stephano and Andrea, immigrants from Messina, Italy, whose company made some tentative plantings in San Jose, California in 1922. A few crates were initially shipped to Boston, where there was a thriving Italian immigrant culture in the North End. The broccoli business boomed, with the D'Arrigo's brand name "Andy Boy" named after Stephano's two-year-old son, Andrew, supported by advertisements on the radio. Broccoli and cauliflower, which are actually cultivars of the same species, have been crossbred to produce brocciflower. It was first cultivated in Europe around 1988. Its very pale green heads are densely packed like cauliflower but it has the flavor of broccoli. There are three commonly grown varieties of broccoli. The calabrese is the most familiar, with large green heads and thick stalks, and is named after Calabria, the region in Italy where it was first cultivated. It is planted in spring and farmed in August. Sprouting broccoli has a larger number of heads with many thin stalks. It is planted in May to be harvested during the winter or early the following year. Romanesco broccoli has numerous small cone-shaped heads arranged in spirals, and is yellow-green in color. White and purple varieties are also available in some areas. White and purple varieties are also available in some areas. Extreme close-up of broccoli florets. Allen, R., and Z. Allen. 2007. Broccoli: The crown jewel of nutrition. Vegetarians in Paradise. Retrieved July 29, 2007. University of California, Berkeley. 2007. Diindolylmethane. Diindolymethane Information Resource Center at the University of California, Berkeley. Retrieved June 10, 2007. University of Warwick Media Centre. 2007. Research says boiling broccoli ruins its anti-cancer properties. University of Warwick Medical School News. Retrieved June 10, 2007. This page was last modified on 7 October 2008, at 20:07.